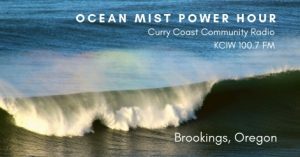 In the Ocean Mist Power Hour, Misty Young (a very curious and energetic soul) explores a wide range of topics and often interviews fascinating, interesting guests. Broadcasting on 100.7 FM, KCIW, Curry Coast Community Radio and podcasting on the web, topics include everything from leadership and business to science, the intersection of quantum physics and molecular biology to spirituality, evidence-based nutrition, fitness, yoga, healing, singing, meditation, birds and other animals, fast cars, history, interesting stories from the world renowned, premier think tank Brookings Institution and more. In this episode of the Ocean Mist Power Hour, host Misty Young shares the gripping story of the great summer storm of 1972 in which numerous boats capsized and sank and 13 people lost their lives. The rare “autumnal equinox” storm, came up suddenly, blasting winds of nearly 90 knots, cutting off communications, toppling trees and wreaking havoc for two hours before it vanished and a normal summer day resumed. There Were No Birds was written by Jayne Gibne, used with permission from Kathy Lindley Hall of Oregon Trawler.